We shoot pistol and gallery rifles on the Melville range at Bisley, over distances of 25yds and 50yds. Small calibre (.22LR) rifles, including semi-automatic rifles. Pistol calibre rifles (.357, .38 and .44 for example). The club has a .22LR semi-automatic rifle and a .357 "cowboy action" rifle that can be used by its members on the Melville range. Please see the calendar for details of the forthcoming pistol shoots. 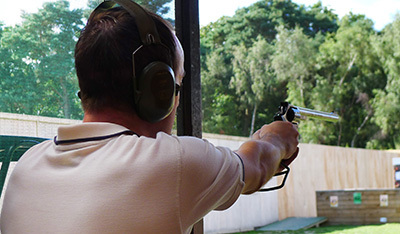 For more information about our pistol / gallery rifle shooting, please get in touch via the contact page.